Adopted in 1939, the Flag of the United States Marine Corps (also known as a standard or battle color) is scarlet with the Corps emblem in gray and gold. Marine Corps Order 4 had established scarlet and gold as the official colors of the Corps as early as 1925. The indoor/parade version is bordered by a gold fringe while the outdoor version is plain. We carry only officially licensed US Marine Corps. flags - beware of foreign-made knock-offs! 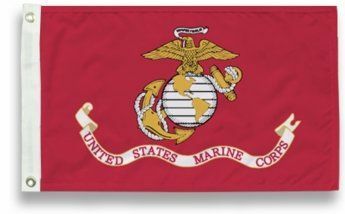 AmericanFlags.com features U.S. Marine Corps flags in two materials - military-grade nylon and standard polyester. 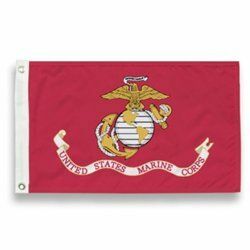 We offer Marines flags for sale in a variety of sizes from 12" X 18" to 6' X 10'. AmericanFlags.com also carries handheld Marines flags, which are perfect for parades, ceremonies and other events.